This week is Mental Health Awareness Week. With 1 in 4 of us being affected by mental health conditions at some point in our lives, it is vital for us as a community to raise awareness, break stigmas and have conversations about our mental health. This follows the recent, 'Heads Together' campaign, which saw Princes William and Harry breaking royal protocol to discuss the impact that their mother's death had on their mental health to promote the importance of conversations for removing stigmas that surround mental health. The theme for this year's Mental Health Awareness campaign is 'Survigin or Thriving? ', bringing focus to the importance of developing resilience and tools that support us to thrive mentally. Across the week, the Mental Health Foundation will explore the stories of people who are both surviving and thriving in terms of their mental health and examining the reasons behind their struggles and successes. To find out more about the campaign, events that are taking place and how you can get involved, visit the MHAW website. 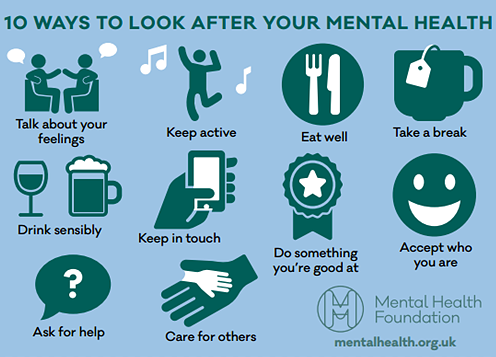 The campaign also looks at the steps we can all take to look after our mental health, building resilience to cope with the demands of life; see below for 10 ways to look after your mental health. The timing of this campaign is particularly relevant for the UEL community given the additional pressures that end of year assesments and deadlines bring. We'd like to take this opportunity to remind you that the Health and Wellbeing Team are here for you during what can be a stressful period of the academic calendar. If you are struggling with your health or wellbeing, do not hesitate to refer yourself for support through The Hub.